Well, Cricket on the Continent is quite a find for those who enjoy following the fortunes of associate countries and others where it might not be assumed that cricket is played. In his excellently-written book, it is also clear that Tim Brooks has a passion for the lesser-known countries playing cricket on the continent and he is to be commended in highlighting the exploits of such countries. In addition to a synopsis of the countries, Tim also identifies the role of the ICC through the years and other esteemed bodies including the MCC. It can be seen that, with so many countries now participating in cricket, it is not always easy for many to go on to become full members and Tim takes the reader through the tournaments process and ICC structure whilst making suggestions of his own. He deals with the subject of expats expertly: some countries rely heavily on such players whilst a few prefer to try and use the home-grown talent. Without such players, it is certain that some countries would not play the game and it is terrific to see cricket, if not always thriving in some countries, at least able to participate. It seems that, in many places, cricket was introduced by the British whilst there have been some intriguing introductions made by people who have watched and enjoyed cricket in England who have thereafter taken the idea home. On a personal level, Tim Brooks has reminded me of many a happy time playing on the Liston in Corfu and scoring on the outskirts of Paris at the Chateau de Thoiry. My mentor, Bill Frindall, was a patron of German cricket whilst the former, fine Hampshire wicket keeper, Bobby Parks, was once coach of the French side. All these countries feature in Cricket on the Continent and I feel that forthcoming visits to some countries could provide an excuse for trying to find their grounds. 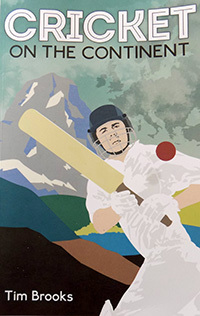 There is much of interest in Tim Brooks’s Cricket on the Continent and, whether readers wish to find out how this form of cricket is run or to just find out which countries participate, it is very well worth reading. Tim has done a sterling job in championing the cause of the lesser-known cricket-playing countries.